You may have heard about the show "Dancing with the Stars", but now it's time to talk about the "SandDance"! SandDance is the Microsoft Research data visualization project, spearheaded by Steven M. Drucker and Roland Fernandez, that experiments with new genres of visualization and represents an innovation in user interactions. With SandDance, every data element is always represented on the screen, and animated transitions are used between views to help people explore, understand, and communicate insights in their data. 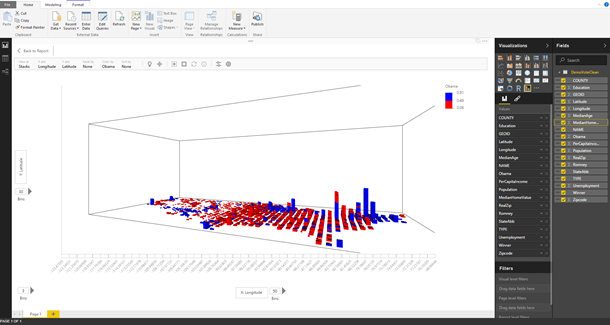 The SandDance custom visual puts this innovation from Microsoft Research into the hands of users through the open, extensible visualization framework of Power BI that can leverage rich connectivity, modeling, and interactive reporting. If you need a visualization that lets you "see the forest for the trees", or in other words shows the big picture by observing the more granular details, then SandDance is for you. The focus of SandDance is on tasks where data is not pre-aggregated (that is, many individual records), and can be rearranged in groups on the screen to create meaning. To use this powerful visual, simply download the SandDance chart from the Visuals Gallery. Import it into your Power BI report, and drag all the fields that you would like to use into the Values field bucket. Here is a sample file for you to get started. Once you have created a SandDance chart you can change the View, and there are some interesting types available, including 3D. You can also Sum by any column in the dataset. While this may look like a summary chart, it is actually created with many rectangles. This can be seen more clearly if we color the rectangles differently. In the Color by options you can select the color palette. You can use Facet by to view the same visualization broken up by different ranges of a particular attribute. You can change the behavior of dragging the cursor from the default of selecting shapes to zoom or 3D rotate using the navigation panel button in the menu bar of SandDance. And that's just the beginning of how you can customize SandDance — there are many other functionalities that you can enable using the settings button. Note that you can also place other visuals on the canvas and they will interact and cross filter with SandDance just like any other visual. This is particularly cool, as you can explore your data in many perspectives. As usual, we can’t wait to hear your thoughts and ideas for improvements. Here is a sample file for you to try it out.